The relative absence of controversies relating to Halal certification in Norway speaks about a more pragmatic side of state-Muslim relations in Norway than polarizing media headlines may suggest. Halal Certification Sign in Oslo. Photo: Sindre Bangstad. In spite of a substantial volume of academic research on Islam and Muslims in Norway, processes relating to halal certification in Norway have hardly been covered by Norwegian scholars. Not only that, but these processes have by and large gone under the radar in the often polarized and virulent Norwegian political and media debates on Islam and Muslims in Norway. Issues relating to halal slaughter, certification and sale have in numerous other Western European countries served as flashpoints for public controversies relating to the presence of Islam and Muslims and Muslim claims-making. Halal certification is a matter seen as crucially important to practicing and organized Muslims in non-Muslim contexts. Norway constitutes no exception in this regard. 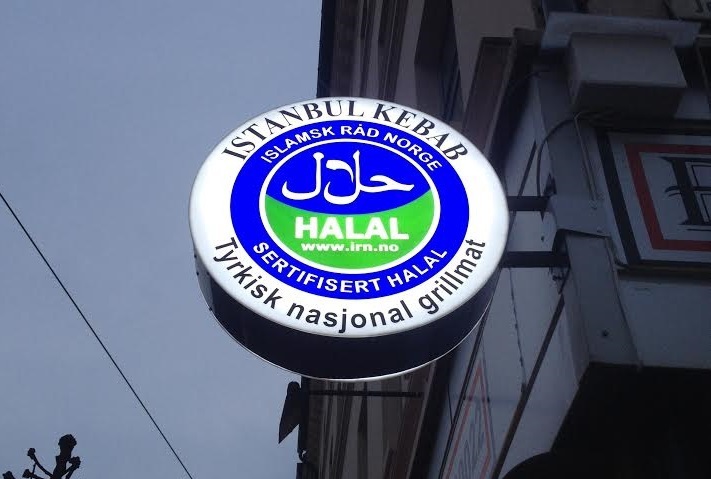 After many years of ad hoc solutions and scandals relating to non-licensed and non-professional ‘halal certification’, the Sunni-dominated Muslim umbrella organization Islamic Council of Norway (Islamsk Råd Norge, IRN, established 1994), with the tacit support of government and the most important meat producers in Norway, established a virtual monopoly on halal certification in Norway in 2012. The IRN’s privileged partner in this field has been the industrial meat producer NORTURA, which is currently estimated to control ca. 80 % of the Norwegian market in halal-certified meat. To the IRN, this matters both in terms of the financial revenue it brings to the organization, but also in terms of the claim to hegemony of representation of Norwegian mainstream Muslims it brings. For NORTURA, the production of halal certified meat constitutes a very small part of its product line, centered upon its new plant at Elverum in Eastern Norway. According to sources at NORTURA, the halal certification scheme has so far not yielded any corporate profits and returns on the substantial infrastructural investments made by NORTURA. Illegal smuggling of halal certified meat and bulk purchases of halal certified meat from Sweden and other neighboring countries remain crucial impediments to corporate profitability in this field. The introduction of halal certification at the hands of the IRN and its attempt to monopolize the market in this field has not gone uncontested. NORTURA’s Norwegian meat producing rivals that purport to produce ‘halal meat’ has continued to offer ‘halal’ product lines, even though they have according to the IRN no plant facilities or mechanisms for the production of halal-slaughtered meat, and have not submitted to the IRN’s certificatory regime, standards and controls. Such is the case with the small producer Ytterøy Chicken. Norway’s food inspection authorities – Mattilsynet – have furthermore on occasion found pork in meat produced by small Norwegian producers certified as producing halal-slaughtered meat by the IRN, leading the IRN to retract its halal certification in some cases. This was the case with the small meat producing company Smedstuen Gård. In Norway, as in most other European contexts, Muslim communities are fractured along lines of ethnicity, sectarian identities and practice. The IRN’s attempt to establish a monopoly on halal certification and to assume hegemony in this field has not gone uncontested. A number of Muslims in Norway – mainly of Turkish Sunni and Suleymanci-orientation – do not accept the methods of halal slaughter approved by the IRN, which are broadly consistent with Norwegian animal welfare regulations. The crux of the matter is that pursuant to Norwegian animal welfare regulations, animals should not be fully conscious while being slaughtered. The Norwegian Supreme Court has in a case relating to indigenous Saami reindeer slaughter without sedation decided in 2008 found that animal welfare regulations should take precedence in cases of conflict with traditional beliefs and practices. For Norwegian-Turkish Suleymanci Muslims, the fact that the IRN accepts these animal welfare requirements for meat certified as halal renders the IRN’s claim to be certifying halal products null and void. Suleymanci Muslims anchor their arguments in the views of their own religious authorities. The Norwegian-Turkish Suleymanci organizations, which claim to represent 5000 members in Oslo, Drammen, Nedre Eiker and Stavanger in Norway, have over the years been left to compete for small import quotas with heavy import tariffs on meat they import from Germany. This basically means that the halal meat they resell have a purchasing cost for their members and consumers which are for all practical purposes both unprofitable and unsustainable. It is also noteworthy in this context that the import quotas which they compete for are divided between halal and kosher meat, and that the quota granted by the Progress Party-controlled Ministry of Agriculture in 2015 included significantly lower tariffs on kosher meat for Norway’s much smaller Jewish community than for the Suleymanci Muslim communities, as well as a much smaller quantity per member for the former than the latter. Interviews I conducted with representatives of the Suleymanci Muslim community in the context of a Norwegian Research Council-funded project on ‘Muslim diversity and Governance of Islam’ indicated a high level of discontent and frustration with the IRN for their refusal to take up the Suleymanci Muslim communities’ case vis-à-vis Norwegian authorities, and the IRN’s attempt to monopolize the field of halal certification in Norway, and through that mechanism, present themselves as the hegemonic representative of Muslims in Norway. The Suleymanci Muslim communities were also frustrated with the apparent lack of willingness on the part of both the IRN and the Ministry of Agriculture to address what they clearly regarded as a differential treatment of Norwegian Jews and Muslims. Following the seminal work of Jonathan Laurence on the institutionalization of Islam in various Western European countries since the 1980s through processes of ‘governance’, one may easily characterize the establishment of a regime for halal certification in Norway since 2012 as part of a deepening institutionalization of Islam and Islamic infrastructure in Norway. The predominant logics of this social field have been of a pragmatic and bureaucratic kind, which has a relatively long lineage in the approach to accommodating religious and cultural diversity in Norwegian state bureaucracies since at least the 1980s. Though often cast as an instantiation of a contemptible ‘multiculturalism’ by an ascendant Norwegian far-right, these logics have as a matter of fact historically not been anchored in any multiculturalist approaches (of which there have according to most serious accounts been precious little in Norway, the state approach to national minorities since the 1980s being the main exception), but have rather been anchored in welfare-state approaches premised on equality among citizens. It is a bit of a paradox that the institutionalization of halal certification and increased import quotas for halal slaughtered meat that do not meet Norwegian animal welfare requirements has happened under the reign of a Norwegian populist-right wing Minister of Agriculture from the Progress Party. The annual quota for imported halal meat was increased from 15 tons in 2013 to 30 tons in 2015. For the Progress Party has not only had opposition to immigration in general and to Muslim immigration in particular as its main mobilizing factor since the mid-1980s; its party leaders and MPs have over the years engaged in a long and sustained record of Islamophobia. Its MPs have on numerous occasions portrayed the provision of halal foods and halal slaughter as an index of a purported ‘Islamization of Norway.’ The Progress Party vice-chairman and MP Per Sandberg last made such claims less than three months before his own Minister of Agriculture MP Sylvi Listhaug announced an increase in the annual quota of halal meat in April 2015. Halal certification has also led to a limited level of online mobilization from Norwegian animal welfare activists and anti-Muslim activists, who have deliberately targeted staff at the IRN working with this, and also staff at NORTURA. The only tangible result of this activism has been an announcement from NORTURA that its brands would no longer mix halal-slaughtered meat with ordinary meat aimed at non-Muslim customers. My interviewee at NORTURA noted with no small amount of amusement that imported meat from countries such as Botswana and Namibia, which regularly appears at non-Muslim Norwegian dinner tables due to its comparatively low prices and imported as part of a long-standing Norwegian government- scheme designed to increase trade with less developed countries, are in fact slaughtered as halal meat in plants in Gaborone and Windhoek under conditions which from the point of view of animal welfare concerns should be much more problematic than halal-slaughtered meat from NORTURA’s plants in Norway. So the interesting paradox is that this meat is in practice also halal-slaughtered, but is never publicly acknowledged or recognized as such, and does not affect the halal and kosher quotas. From 2013 and onwards, the Norwegian state’s overriding interest in and prism through which state-Muslim relations have been seen, have related to ‘counter-radicalization.’ For all practical purposes, halal certification has on the part of the state been a side-issue of limited interest. It is therefore hard to avoid the conclusion that a relative lack of media and scholarly attention and attendant politicization, is an important key to understanding the dynamics of fields in which bureaucratic and pragmatic logics prevail.